St Andrew was the first of the twelve apostles and St Peter’s older brother. He was born, sometime in the 1st century, in Bethsaida, a lost city or village that once stood on the northern shores of the Sea of Galilee in Palestine, now Israel. According to the Gospel of Matthew, Jesus was walking along the shore of the Sea of Galilee when he saw Andrew and Peter fishing and invited them to become his disciples and ‘fishers of men’. The Gospel of John tells a slightly different story; in this, Andrew was a disciple of John the Baptist before being a follower of Jesus and introduced his brother to Christ, saying, “We have found the Messiah” (John 1:41). John also suggests that Andrew may have identified the means with which to feed the five thousand. When Jesus was confronted by that great company and asked, “Whence shall we buy bread, that these may eat?” Andrew said to him, “There is a lad here, which hath five barley loaves, and two small fishes: but what are they among so many?” (John 6:9). The apocryphal Acts of Andrew, said to be written in the late 2nd/early 3rd century, say that Andrew travelled around Anatolia and the Black Sea area, to Byzantium, Thrace, Macedonia and other lands, preaching and performing miracles, until he finally ended up in Patras, Greece. Here, because he refused to stop preaching the Christian message, and because he also denied the Roman gods, Andrew was sentenced to death. The story is that he was crucified, by his own request, on a diagonal cross, and roped to it rather than nailed, because he deemed himself unworthy to be crucified in the same manner as Jesus had been. Some claim that Andrew actually died on an olive tree and the cross was a later medieval invention, the X representing the first letter of the Greek word for Christ, Christos. Anyway, the date of Andrew’s crucifixion is traditionally 30th November 60AD and the diagonal cross, crux decussate, or saltire, is now commonly known as a cross of St Andrew. Why is St Andrew the patron saint of Scotland? Unlike St George, whose selection as patron saint of England appears to have been fairly random, some effort, at least, has been made to link St Andrew with Scotland. The popular tale goes that St Andrew’s remains were preserved at Patras and, in the 4th century, the guardian of them was a monk called Regulus, or Rule. Regulus had a vision in which an angel told him that the apostle’s relics would be taken to Constantinople (Istanbul), so he decided to hide some of them before this removal could happen. Sure enough, shortly after he’d done that, the Emperor Constantius II ordered that St Andrew should be moved to the capital. Regulus then had a second vision, in which he was told to take the saint’s remaining bones onto a ship and head west, to the ends of the earth, until he was shipwrecked; and there he should build a shrine to the saint. So Regulus set sail and eventually came ashore on the headland of Fife Ness in what is now Scotland, anciently known as Muck Ross, in the village of Cennrigmonaid, or Kilrymont, which later became the town of St Andrews. And there, the saint’s relics – three fingers of his right hand, part of an arm, a kneecap and a tooth – were re-interred. I bet, like me, you’re intrigued as to why Regulus decided to rescue those particular parts of the saint’s remains. An alternative story is that St Andrew’s relics had been collected from Rome (no idea how they got there, sorry) by Bishop Acca of St Andrews Abbey in Hexham, Northumbria, where the saint was already venerated, and brought to Kilrymont by Acca in around 731AD. There was certainly a monastic community at Kilrymont by around this time: Irish annals record the death of an abbot called Tuathalan, in 747; this community may well have been founded by the Pictish king, Onuist, son of Uurguist, also known as Oengus I, or Angus (ruled 732-761). It is not known whether the monks had any particular saintly or osseous allegiances. The remains of an extravagantly carved sarcophagus dating from the late 8th century, the St Andrews Sarcophagus, might have contained the remains of a Christian Pictish king – or perhaps a saint’s relics. However, given the popularity of saints in the first millennium after Christ, we still haven’t explained how St Andrew was chosen from so many potential candidates to be Scotland’s particular saint. The traditional legend is that, in the year 832, a joint army of Picts and Scots under King Oengus II met an Anglian Northumbrian force under King Aethelstan near what is now Athelstaneford, east of Edinburgh. The night before the battle, King Oengus prayed that his heavily outnumbered soldiers would prevail in the coming fight and St Andrew appeared to the king in a vision, promising victory. The next day, as the two sides faced each other, they saw a curious cloud formation, a diagonal white cross against the blue sky. Sure enough, the Picts and the Scots won a great victory, Aethelstan was killed, St Andrew was declared Scotland’s patron saint and the saltire has been Scotland’s flag ever since. It’s a great story, which has obvious propaganda value, as well as echoes of a more famous legend, in which the Roman Emperor Constantine sees the symbol of Christ in the sky before his victory at Milvian Bridge in 312AD. Unfortunately, the King of Northumberland in the 830s was someone called Eanred, who we don’t know much about. Aethelstan came later, and was from Wessex, not Northumberland; he is generally accepted as the first king of all England, who took the submission of the kings of the Scots, Strathclyde Welsh, Cumbria and the Earl of Northumbria in 927 and then crushed a combined force of Vikings, Welsh and Scots at Brunanburh in 937. So, if the Battle at Athelstaneford happened, the enemy was neither the Northumbrian Angles, nor Aethelstan. The Picts under King Bridei did beat the Angles at the Battle of Dunnichen in 685AD, but no one mentions St Andrew in connection with this. St Andrew’s apostolic heritage would always make him an important figure to the early Christian church. He was widely venerated; there are hundreds of churches dedicated to him – 600 pre-Reformation churches in England alone, apparently. But, sadly, there is no certainty about when or if St Andrew’s body parts arrived in Scotland, or the wonderful story of the saltire in the sky. The trouble is, of course, we’re into an area where a lack of evidence combined with the great passage of time, healthy doses of religious mythology, vested interest and cynical exploitation, makes the truth a little hard to discern. It doesn’t help that versions of the stories appear all over the Internet without qualification, including some that should know what they’re talking about – like the website for Scotland’s official tourist authority. From what I can make out, we can be pretty sure that, probably in the 8th or 9th century, a cult of St Andrews somehow became established in Scotland centred on Kilrymont/St Andrews. He replaced St Columba, the man credited with bringing Christianity to Scotland – perhaps partly because Columba represented the unfashionable Celtic, rather than Roman Catholic, faction. By 11th century, St Margaret of Scotland, Queen from 1070-1093, felt it helpful – or necessary – to institute a ferry across the Firth of Forth to assist pilgrims travelling to St Andrews – incidentally thus founding the towns of South and North Queensferry in the process. The earliest building in St Andrews now is believed to be the church of St Regulus – St Rule’s Church – which dates from the 11th or 12th century. 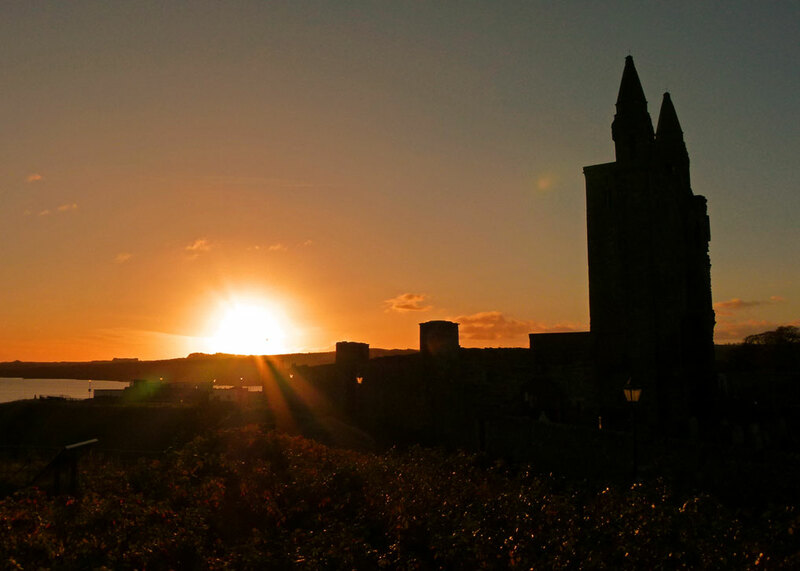 An Augustinian Order was established at St Andrews in the 12th century, supplanting the existing order of Culdees (a monastic community with Celtic roots), and work began building a grand cathedral in c1160. Ultimately, this would hold the great shrine containing St Andrew’s relics. 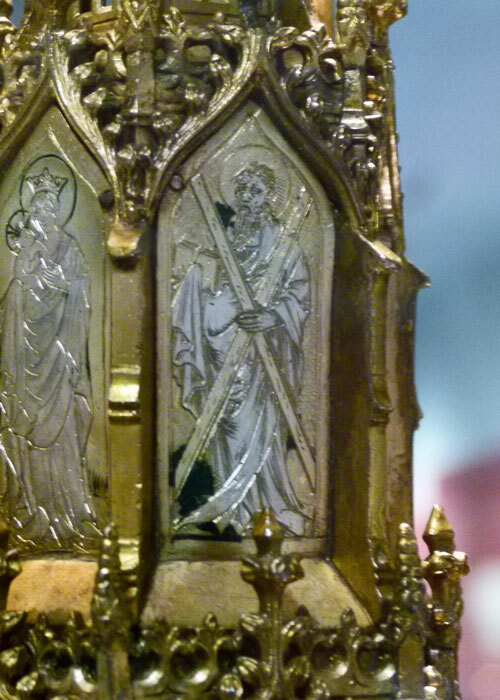 In the Middle Ages, having a saint’s relics in your possession was like winning first prize in the tourism lottery. So it is quite plausible that the legends of St Andrew’s relics arriving in Fife, and the appearance of the saltire in the sky, were encouraged, or even (heaven forbid) embellished. Promoting these stories also had a political purpose, in that it helped contest a claim to primacy by the archbishop of York and helped maintain a separate identity from England. 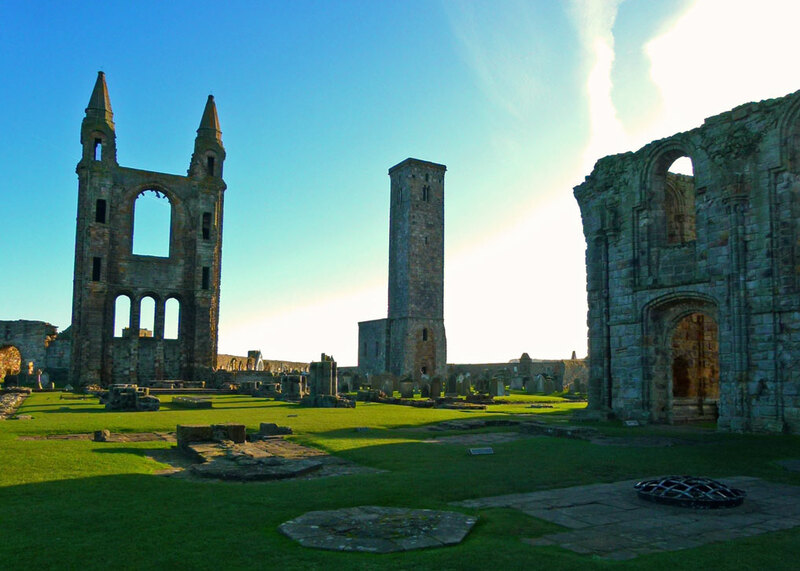 St Andrews certainly prospered, becoming Scotland’s most important cathedral town, rivalling Canterbury in England – some say even placing the Scottish burgh on a par with the shrine of St James at Santiago de Compostela in Spain. All that disappeared in the Scottish Reformation, when St Andrews’s shrine was destroyed by Protestant iconoclasts. St Andrew’s image, and the saltire, was being used on seals in Scotland from about 1180 onwards. 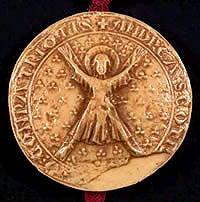 In 1286, when Scotland was ruled by the Guardians of Scotland in the absence of a king, their seal included the words: Andrea Scotis dux esto compatriotis (Andrew be leader of the compatriot Scots). Significantly, St Andrew is also referred to as patron of the Scots in the Declaration of Arbroath, the letter the Scottish Barons sent to Pope John XXII in 1320, asserting their independence. Mind you, the greatest order of chivalry in Scotland is not called the Order of St Andrew, but the Order of the Thistle – though, as patron saint, St Andrew does appear on the insignia. England’s equivalent is the Order of the Garter. Today, the Saltire, a white cross on a blue background, is the national flag of Scotland. It can be seen everywhere, everyday, from flags on government buildings to symbols on cartons of Scottish milk in the supermarket. The first evidence of the cross being used as an emblem on its own, without St Andrew, was in 1385 when the Scottish Parliament ordered it to be worn on soldiers’ surcoats, though using black rather than the blue we are used to. A white saltire on a sage green background is said to have appeared on the standard of the Earl of Douglas at the Battle of Otterburn in 1388. There is reference to a roll of blue bunting with a St Andrew’s cross on it in the accounts of the Lord High Treasurer of Scotland for 1512 and the main flag for the warship Great Michael in 1513 seems to have been a St. Andrew’s cross on a blue background. In 1606, King James combined the white saltire on blue with the red on white cross of St George to create a ‘British’ flag – and the design became official with the Act of Union in 1707. The concept was continued with the Act of Union between Ireland and Great Britain when the red saltire on white of St Patrick was added, creating the Union Flag, or Union Jack, still in use today. I’ve also read that the saltire can sometimes be seen carved into fireplaces, not only in Scotland, to prevent witches flying down the chimney. You will see the saltire all over the world, used by a huge variety of nations and organisations, including Jamaica and the Russian navy; it also featured in the Confederate battle flag of the American Civil War. St Andrew’s remaining bones were removed from Constantinople to Amalfi for safety, either in 1204 when the city was sacked by French and Venetian crusaders, or after it fell to the Turks in 1453 – I can’t decide which. Anyway, you’ll be delighted to hear that, in 1879, the Archbishop of Amalfi gave an alleged piece of St Andrew’s shoulder blade to the re-established Roman Catholic Church in Scotland. Then, in 1969, Pope Paul VI generously donated part of the saint’s skull. Both remains are in St Mary’s Catholic Cathedral in Edinburgh; so Scotland still has a shrine to St Andrew. It is understood that the other bits of the poor chap’s mortal remains, if that’s what they really are, have been returned to Patras. If, in the 21st century, you should inexplicably find the whole business of relocating and venerating bones just a wee bit bizarre, and maybe a tad macabre, that’s perfectly OK.
How important is St Andrew today? It was partly to answer this question that Mrs Britain and I took ourselves off to visit St Andrews, to take a look at the ruined Cathedral, St Rule’s Church and soak it all up. If you haven’t visited, it is a lovely place, by the way. We discovered that the loss of Andrew’s digits, knee-cap etc have been compensated for by the arrival of a new cult, called golf. Whilst the town has a huge respect for its past, the veneration of St Andrew disappeared at the time of the Scottish Reformation, which had a profound impact on the town and is a story in its own right. The Church of Scotland that evolved from this not only does not have bishops, but also doesn’t really ‘do’ saints either. And it certainly doesn’t do relics. This might explain why seemingly secular events such as New Year (Hogmanay), Burns’ Night and certain football matches have generally received more attention across Scotland than St Andrew’s Day has. Ah but, you say, “St Andrew’s Day is not so much a saint’s day as a national day; that’s why the Scottish parliament passed the St. Andrew’s Day Bank Holiday (Scotland) Act as recently as 2007, so that everyone could celebrate it”. Very true – but banks do not have to close and it is up to each employer to decide whether to make the day a staff holiday. Students at the University of St Andrews are given the day off – but that’s a local tradition. Don’t get me wrong – of course there are St Andrew’s Day events – but it seems like St Andrew’s Day, the big holiday celebration, is too recent a notion to have become a fixture on most people’s calendars. It might be a different matter in other countries. 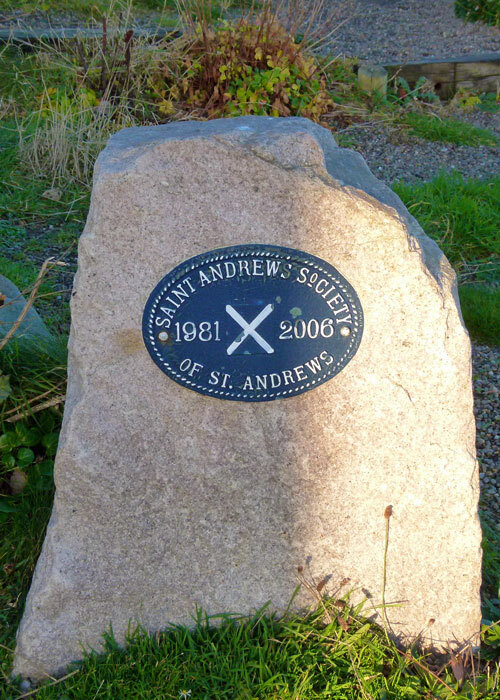 Near the harbour in St Andrews is a stone with a plaque advertising the St Andrew’s Society of St Andrews. A search on the Internet revealed absolutely nothing at all for that, and indeed no significant organisation in Scotland whatsoever; but there are plenty of St Andrew’s Societies located all over the world, including in Abu Dhabi, Bangkok, Bradford, Hawaii, London, Montreal, Panama, Surbiton and West Australia. Some of these societies are primarily social, with events organised to celebrate Scottish heritage, but others seem to be almost entirely charitable in nature, based on the premise that St Andrew’s reputation is of a kind man who helped others. The two oldest societies are The St Andrew’s Society of Charleston, founded in 1729, followed by The St Andrew’s Society of the State of New York in 1756. Both were formed by people of Scottish heritage for philanthropic purposes. I have eventually got round to writing about St. Andrew in Amalfi. My research lead to the evidence that St. Andrew’s skeletal remains were removed from Constantinople to Amalfi. And from there (not mentioned in my post), some of his body parts were gifted to Rome and Scotland. The Rome relics were gifted to the Eastern church in Patras. Thanks, CP. That’s a wonderful article. Though I wouldn’t rely on one source for this kind of thing – the whole business of relics can be a little unreliable to begin with! I based my article on the source I mentioned and linked to sources of information on where other artifacts are claimed. I did a fair bit of research and found that source I used was on balance to be the most reliable. With brief facts it brought all the claims on the relics together and explained why they were in their respective places. Very interesting, and a great write up! I was wondering about the history of St Andrew the other day, and his connection with Scotland. I almost just typed “funnily enough”, but given that it was coming up to St Andrew’s Day, it’s not that strange a thought really! Thank you. No, I suppose not! Well, a great story of St. Andrew and Scotland. I don’t worry too much about the finger bones and such, but I go with the story of the battle at Athelstane, where the Scots considered themselves saved by the white cross in the sky. We have always been after ways to get victory over the English, one way or another. I do remember we were disappointed that so little of the cathedral in St. Andrews is left. The Protestants did a good job there (from their perpsective). I prefer the cathedrals where something of the building was left as a ruin to see. I do agree that the biggest contribution was the flag, symbol of Scotland. For me that’s really the point of the St. Andrew’s story. Hugely impressive post Mike. I hate to think what Andrew himself would have thought about all the fuss made about his bones! I would prefer to remember him in real life as recorded in the New Testament accounts you describe. What about adding the Iona community to your list of things Scottish? The influence of that place on all of us in these islands has been tremendous. I’m sure Andrew himself would have rejoiced at that! Thanks, Richard; I really appreciate that. Iona is certainly on the list, but it might be awhile before I get there! It would certainly have put me off. Didn’t they crucify about 6,000 at the end of the Third Servile War (Spartacus Revolt)? Given your usual comprehensive research, I’ll let you off not knowing how his remains got Rome. Great ‘beam me up’ joke. If history isn’t convenient, or lost, it’s always been ducky to make up stuff on the fly for the gullible and needy. Here in Tampa we celebrate Gasparilla Day, for the ignoble Jose Gaspar who may or may not have plied the waters of the Gulf as a pirate. We celebrate odd things in order for an excuse to over indulge. … Loved your history. I’m glad old Jose Gaspar hasn’t been forgotten…. An interesting and complicated story, but when did he build the university and the golf course? Down here in East Anglia we celebrate St Edmund’s day, especially in Bury St Edmunds – ’tis an old tradition dating back to 2015! University was founded in 1413 – not sure about the golf. You’ve reminded me that I once heard a radio DJ dedicate a record to someone that lived in Bury Street, Edmunds. It made me smile anyway. The odd collection of bones should have included a big toe so as to connect him better with Gout. I knew none of this but found it another really interesting post. Yes, apparently curling dates back to the 16th century, at least. Most informative and comprehensive, Mike – thank-you! I recently visited Amalfi and saw the elaborate crypt which houses the tomb of St Andrew. Beneath the main altar is a crystal ampoule from which (according to the guide book) on the Saints feast day and sometimes on other occasions, a substance called ‘Manna’ is collected. This is a dense liquid which sweats out from the tomb of the Apostle. Yes, the business of the ‘manna’ is mentioned on the website for St Mary’s cathedral in Edinburgh – but I decided not to mention it. Would love to visit Amalfi anyway – probably warmer than St Andrews! Quite a complicated story! I wonder what the saints would make of their earthly remains being divided again and again and scattered all over the face of the earth like this. Much more fun when we had Woden and the like! Lovely pictures Mike. I thoroughly enjoyed reading about St. Andrew. Very informative and entertaining! Thanks. That was a super run through. I enjoyed it very much indeed and am still chuckling at ‘beam me up’. I wish I could remember who described us Scots as a ‘prideful and obdurate race’….but I suspect he was right. Never said anything memorable in all my life, so no. Hmm – I find that hard to believe. Just follow the White Queens advice to Alice and practice believing six impossible things before breakfast.